State House, Freetown, Tuesday 29 January 2019 – His Excellency President Julius Maada Bio has officially launched the Commissions of Inquiry, COI, which will see the commencement of investigations into activities of previous government officials at the former Special Court, Jomo Kenyatta Road, Freetown. President of the Sierra Leone Association of Ebola Survivors, Yusuf Kabba, said he was thankful to the President and the Government of Sierra Leone for launching the COI. He said that the investigations would bring answers to the cries and sufferings of Ebola victims across the country, adding that Ebola survivors were still facing challenges as a result of misappropriation of Ebola funds by the previous government. He said that Ebola orphans were sleeping in abandoned vehicles, market stores and dilapidated buildings as a result of the mismanagement of Ebola funds. He said in a bid to bring justice to those vulnerable souls, they would humbly urge the COI to look into the issue with utmost diligence knowing full well that they had the prayers and support of the over 4,052 Ebola survivors across the country. Chief Justice, Babatunde Edwards, said that by Constitutional instruments, the country, amidst several options, had sought for the use of the commissions to address a seeming malaise of corruption in all its forms. He said the justices together presented a wealth of experience of over 100 years and that they had been specially and meticulously chosen, adding that that was not their first time of serving on Commissions of Inquiry. Attorney General and Minister of Justice, Dr Priscilla Schwartz, said after some delays, it was a huge relief to have finally arrived at the starting of the COI. She said the President’s commitment to war on corruption and bad governance in the country, as translated in the setting up of the people’s Commission, was not simply a political stance but had followed his constitutional mandate in eradicating corruption. 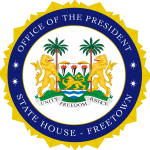 She assured that her office and ministry would continue to work tirelessly through the COI and would implore other state legal processes to support the President’s deep commitment to combating corruption, bringing back accountability in governance and to foster economic growth and justice to the people of Sierra Leone. In his keynote address, President Bio recalled that in his maiden address he launched three peaceful democratic wars: first, a war on indiscipline; second, a war on corruption and third, a war on poverty, adding that the event was to affirm that the peaceful democratic war on corruption was unstoppable, unmistakable and winnable. He noted that corruption was the single most critical deterrent to the development of the country because it was a clear and present danger to the life of every Sierra Leonean, saying that they must confront corruption head-on by being bold and resolute to fight and win the war on corruption. “When monies meant for educating our children and youth population is stolen by just few people that is a threat to our national development. When monies meant for providing basic social services for every citizen are stolen by just few people to build mansions and buy luxury cars, that is also a threat to our national development,” he said. He also mentioned that the Truth and Reconciliation Commission, TRC, report continued to remind us loudly that corruption was one of the main causes of the bloody civil war in the country, adding that despite strong anti-corruption laws, governance institutions and national development had been perennially weakened by corruption. He also recalled that successive government audit reports reminded government between 2007 and 2018 of gross inefficiencies and deficiencies in governance and public accountability, leakages and downright squandering of state revenue and resources, adding that the responses paid a lip service to fighting corruption with sham trials, backdoor acquittals and reinstatement of public officials. “As a people, the Commissions of Inquiry give an opportunity to hold accountable those we once entrusted with public offices. We owe it to our country; we owe it to our compatriots and generations yet unborn to get it right once and for all. This is democratic accountability and our collective determination to win the war on corruption. “Let me end by reiterating that all those who will be invited by the Commissions of Inquiry must fully comply. Anyone, I repeat anyone, who fails to honour the invitation of the Commissions of Inquiry will face the full force of the law. I therefore formally launch the Commissions of Inquiry,” he warned.